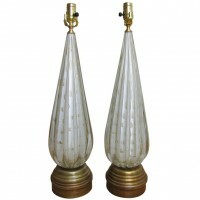 Pair of exquisite white Barbini Murano glass lamps with control bubbles and gold inclusions. Original gilt wood bases. Rewired with full range dimmer sockets.